We set off into the eye of the storm at 12:20 today, determined to nail one of the last remaining coffee shops in Felixstowe despite the donner und blitzen. Plus it's now safe to walk the streets down there once more now that the lost-and-found bomb has finally gone orf. Sound the all-clear. 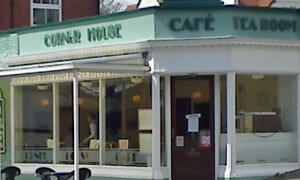 Sunny by the time we strode down South Hill and into the Corner House Cafe, not to be confused with its mirror image over the road, The Conservatory. Talking of which, kinda, the CHC has a mighty white megalith of a mirror on its far wall giving the impression of lots of space, or some sort of weird Frangipani-style double seating area. Attractive old clock on the wall, too. And a sign advising customers not to rearrange the chairs, thank you very much. Had our pick of the tables initially, the serving staff poised like poised people ready to pounce on our orders. Shortly after, more punters came & went. Various brekkies to be had, soup, jackets, and mini versions of most items for tinies. Don't want chips, have the mash instead: they're flexible. Chose a brown bread sandwich: perm any two fillings from fried egg or sausage or bacon. Adorn with squeezy sauce. Result. Wot no leaves or crisps or melon chunk on the side? While Andy did for his ham/egg/chips and Grenvyle cleared his haddock, my eyes wandered to the home baked goodies. Pleasantly full after a generous slice of choc cake and a well-presented latte, the coffee gently undulating, not unlike a lava lamp, at the bottom of its tall glass. Restful and yet highly caffeinated. Did I mention they're closed on Fridays? If it was a car -- Mercedes-Benz A-Class. If they were passing by -- Ruth Jones.